In the digital media world where three months grows a new generation, the CitizenMap of the South China Morning Post, which was developed and launched in late 2010 and now been taken offline, seemed like a dinosaur. However, as the project manager back then, I found the necessity to document the existence of the short-lived platform. And I apologize for my super procrastination. The name sounds vague (purposely, will explain later), but to put it in one sentence: it is an interactive map that allows citizens to report on environmental destructions in Hong Kong – from illegal dumping to unauthorized development, from vegetation removal to columbarium construction. What triggered the idea of the map was an outcry erupted after the Post reported in July, 2010 on the development of a site at Tai Long Sai Wan, one of Hong Kong’s most pristine stretch of coastline. Soon a Facebook group was set up by citizens who were strongly against the development, which quickly attracted 80,000 members – quite a lot in a city that has 7 million population, and showed us that people here cared about their nature. 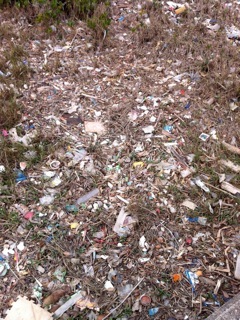 So we decided to do something experimental, starting with environment topic. The site was composed of the following: a map with numbers indicating how many reports were reported at different locations, categories, timeline, featured report, Twitter stream, list of reports and news feed from credible sources such as the Environment Bureau and other mainstream media. The content on the map brought the most value – there were two kinds: citizen generated reports, and SCMP stories, and the later was labeled as “Verified” to distinguish. Some of the citizen reports were very impressive. For example, there was a self-made documentary sent from a resident on Lamma Island on environmental destructions there (though it had to be taken down a couple of days after it was featured on the site because the producer of the documentary claimed that he was threatened). It aimed to offer a collective voice through this mash-up platform by aggregating local citizen reports and media reports as well as other relevant news and information. Why is (was) it significant? Keywords that can be tagged to the project include citizen journalism, crowdsourcing, collaborative/ participatory journalism, user-generated content, environmental mapping, etc. All of them were pretty new to Hong Kong, or even Asia back then. As a story in today’s paper notes, the government has only about 400 officers to track tens of thousands of hectares of open land, so public reports of abuses are increasingly important as a source of tipoffs. Which makes a crowdsourced map of such activities not just a nice way of building community but also a project in the public interest. The recent deployment of the Ushahidi platform by The South China Morning Post is one to watch. The reason why this could be interesting, is that it has the potential to give journalists leads that they can follow up on and gather more facts on issues such as toxic waste dumping. It is harnessing the power of the people to help make Hong Kong a better place. This feeds into the idea of changing behaviour. If individuals/corporations realize that the public is watching and able to report incidents, would they still engage in such activities? So there is value for the society (public monitoring, citizen participation, etc) and also for the paper (corporation social responsibility, journalism scope). What is also worth mention is this model is reproducible: soon after we launched the site, another site, LantauLink Interactive, was set up by a resident on Lantau Island. Using the same Ushahidi platform, it was focusing on the particular issues in that neighborhood – from resorts and eating and drinking, to crimes and eva abuses, to animal abuse and incinerator development on the island. The project won Honorable Mention at the 2011 SOPA Awards for Editorial Excellence, in Multimedia News Presentation category. Not bad. Dig into the SCMP archive and find out a decent number of environment stories over the past year and upload the to the beta site (I wish I had a robot to do that) We called the process “seeding”, so the users would not come to the site with an empty map and confused of what to do. It is also part of the effort to open up the SCMP archive – the paper’s website has a 100% paywall and the stories seeded onto the map were for the public for free. Meanwhile, the newsroom was preparing a series of stories on the illegal development and environmental problems in Hong Kong, and the three stories served as launching stories when the site went live. Before the launch, I asked Reg how we were going to evaluate its impact. His answer, sounded like a joke but delivered in a serious tone, was that so long as we got one submission from the citizens, it would be a success. So it was launched. And within a couple of hours we received a couple of citizen reports. For the first week we got 20+ contributions. Manage social media accounts to promote the project. Its Twitter account still exits though no longer updated. Grassroots groups such as HK Outdoors were helping on social media too, both on Facebook and on traditional forums. Leverage environmental non-profits to get more public attention and expert opinions. Some helped spread the message via their member network, some offered suggestions on how we should categorize the incidents, some provided routes guides for further field trips. Among them are WWF, Conservancy Association, Friends of the Earth, Green Power, just to name a few. Adjust modules on the site. For example, originally there was a timeline under the map, which was a default element coming with Ushahidi, so we left it there, hoping to show peaks of the incidents. But later we realized that time was not a significant indicator for environmental cases, so we took it out and replaced it with a photo slideshow, to give the site a bit multi-media feel, and also to visually indicate the users that the destructions could be really bad. Collaborate with educational institutions – Journalism and Media Studies Centre of the University of Hong Kong was our first partner. We worked with one undergrad new media class for one semester, where students were grouped and sent out to the country parks of Hong Kong, following the routes provided by Conservancy Association, and sent back reports and photos to the site. This guaranteed a constant flow of stories being updated on the map over time for a few months. You may call it cheating – but it worked. Develop a newsroom workflow. This was a somewhat failed attempt, but we tried – the ideal flow would be, citizens submit reports -> I (or whoever manage the backend) approve the reports so they can be shown on the map -> reporter check the site and identify those has high news value and follow up -> the SCMP news follow-up be uploaded to the site as well. But it didn’t really work out that way, partly because the quality of the citizen reports varies a lot, making it difficult for the reporter to judge the value, and partly because the Post only had one environment reporter back then and his daily assignments were enough to keep him busy. Mobile: it would be nice to enable a mobile friendly version where users can upload reports from their smartphone directly, especially given Hong Kong has one of the highest smartphone penetration rate. Back then Ushahidi hasn’t developed a mobile application, and the FrontLine software somehow was not supported by local carriers. We talked to a couple telecommunication operators in town but it didn’t work out. Community building: focus groups to understand the users needs, meet-ups to encourage users to know each other and collaborate, citizen reporting training, etc. Export data: one of the expert from an international environment organization told me that to make this platform valuable for them, the data had to be exportable and also vetted, so they could study the data and develop strategies based on that. Well, it takes time. Business: it was not really in my concerns, but the first question I got from the audience of Digital Media Asia 2010 in Singapore when I was presenting the project was “how you are going to monetize this?” I simply answered “We don’t.” But could crowdsourcing projects like this have a business model? Go beyond environment: that’s why it was called CitizenMap, instead of GreenMap or something like that. The map could be expanded to include greater China, the categories can be expanded to have more layers. I wish someone else could do that someday. I left the Post by mid 2011, and the next Social Media Editor of the Post took over the map. It went pretty inactive over time (not surprisingly), and sometime in 2013 I realized that it was taken down – and the social media editor didn’t know about its death. A quiet ending. Thanks to Kit (designer), Henry Hui (developer), May Leung (marketing), Ben Abbots (digital), Etienne Maccario (digital director), Olga Wong and Chi-fai Cheung (reporters), Quinton Chan (editor), and all those environment non-profit colleagues who supported and helped. It was a collaborative effort. Last but not least, special thanks to Reg, without whom the project would never happen. We were very interested in the Hong Kong Citizenmap as we have developed a “timelined data mapping” module and are currently searching for conceptual partnerships around the world. I was also very surprised that the page was taken down. 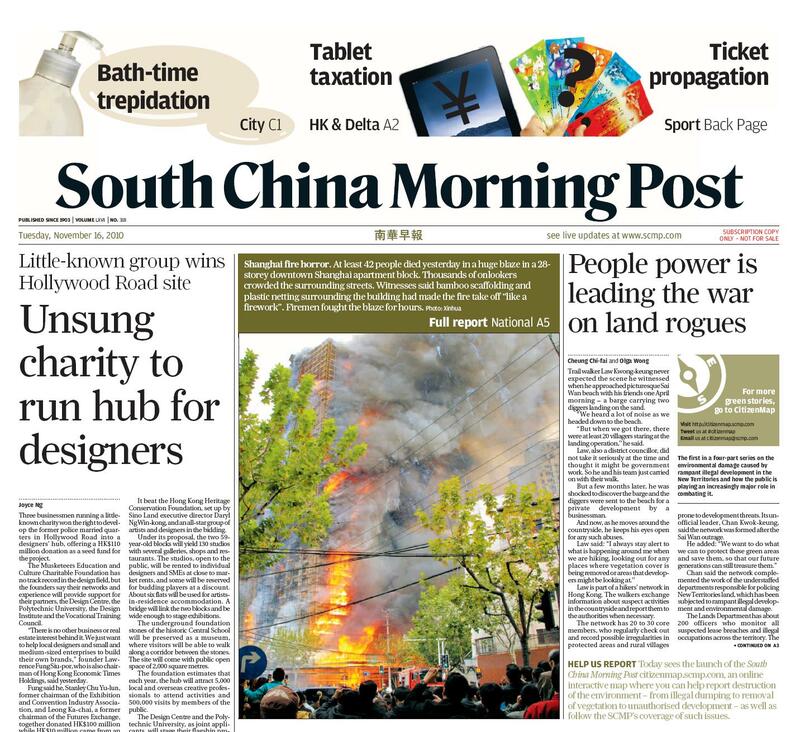 Can you provide me with any useful contact at South China Morning Post to learn about their experiences.